Do you like Bluegrass music with a side of daylilies? 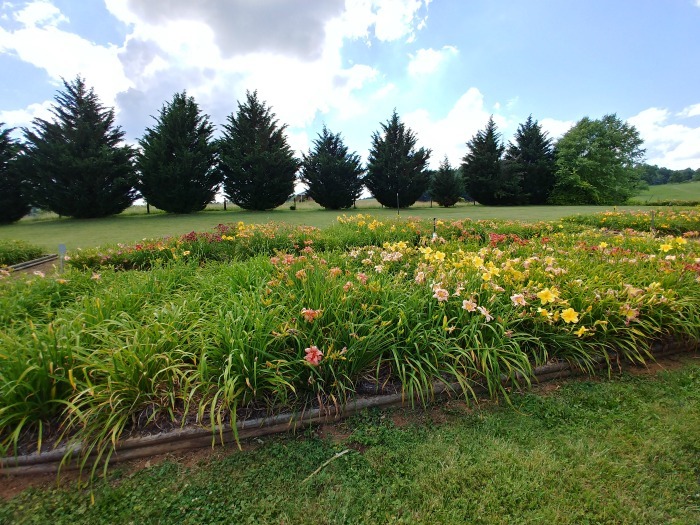 If you do, you’ll enjoy this virtual tour of the daylilies at Wildwood Farms in Floyd, Virginia. Located just 42 miles from Roanoke, VA and very close to the Blue Ridge Parkway, you will find Wildwood Farms. This general store features live Bluegrass music from several bands with a no cover charge. 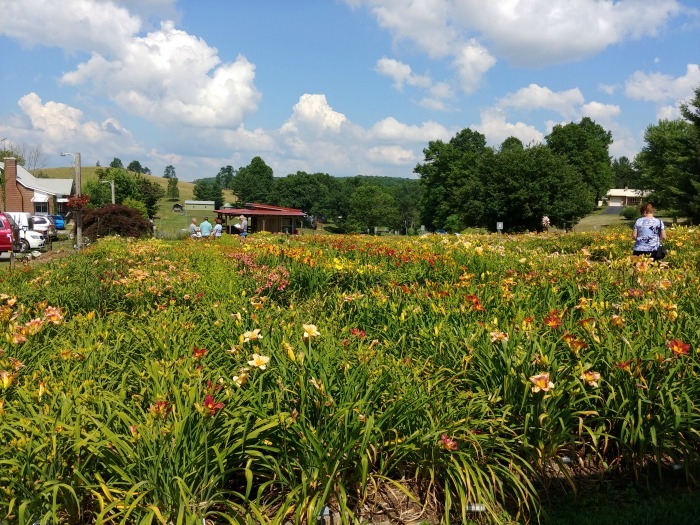 An added bonus for me was that I got to visit their daylily garden – one of the largest commercial daylily gardens in Virginia and a real treat for a day trip from Raleigh. This fun general store has a menu that features burgers, sandwiches and pizzas and a great selection of garden décor items as well as unique garden gifts, home décor and gifts. By far the best part of our trip was touring the daylily garden. 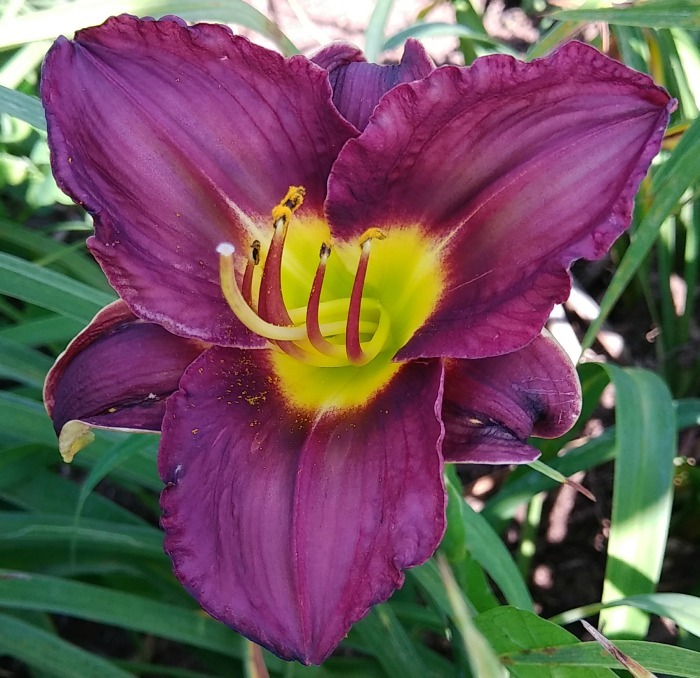 Wildwood farms has been in business for 16 years and has approximately 600 daylily varieties as well as another 600-1000 that will be available in the future. Armed with their price list, I wandered around the packed garden beds just waiting to choose some selections for my test garden. 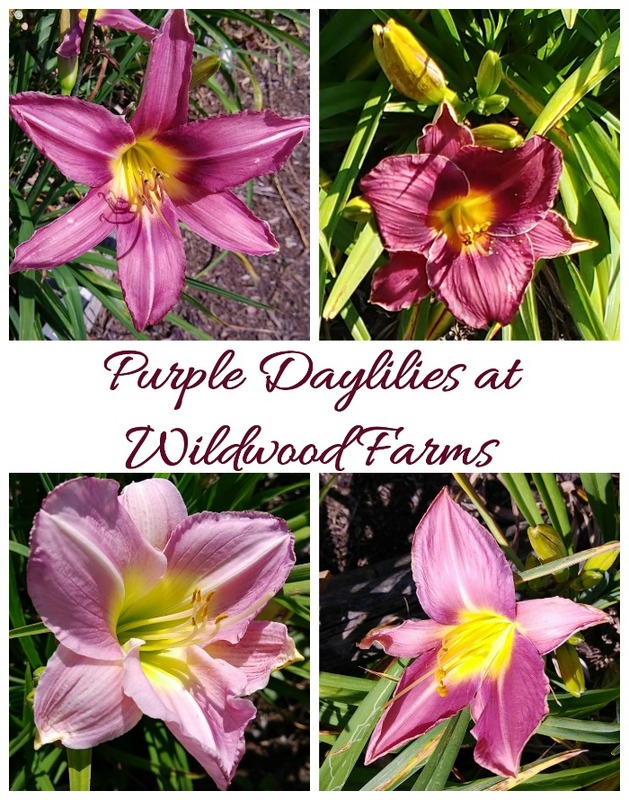 Wildwood Farm has so many to choose from, with a wide variety, including singles, doubles, miniatures, spidery daylilies, and unusual form daylilies. Each variety was in a section of large garden beds with the names of the daylilies for easy identification. I was in daylily heaven as I wandered around trying to decide on my pick(s). We arrived right in the middle of peak bloom season and were just delighted. 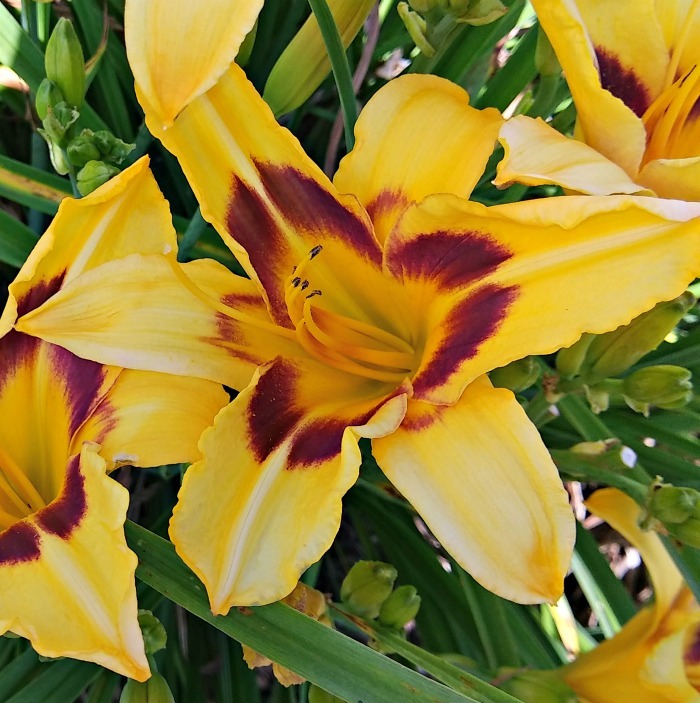 Daylilies are a perennial plant that add brilliant color and texture to any garden bed. The plant grows from a bulb. When you are purchasing daylilies choose those that are large with well developed root systems. Larger plants are easier to grow and will flower sooner. The botanical name for daylily is hemerocallis, which means “beauty for a day.” A truer meaning could not be found. Each flower stem (called a scape) will hold at least a dozen flower buds that keep opening on the plant for several weeks. 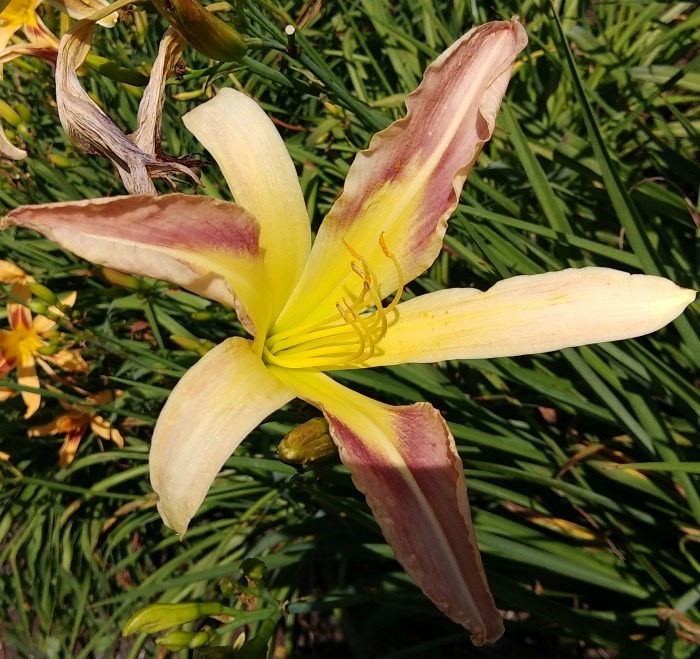 Daylilies can have foliage that is evergreen (green all year long), semi evergreen (lose their foliage for a short period of time) or dormant (dies off in the winter months.) 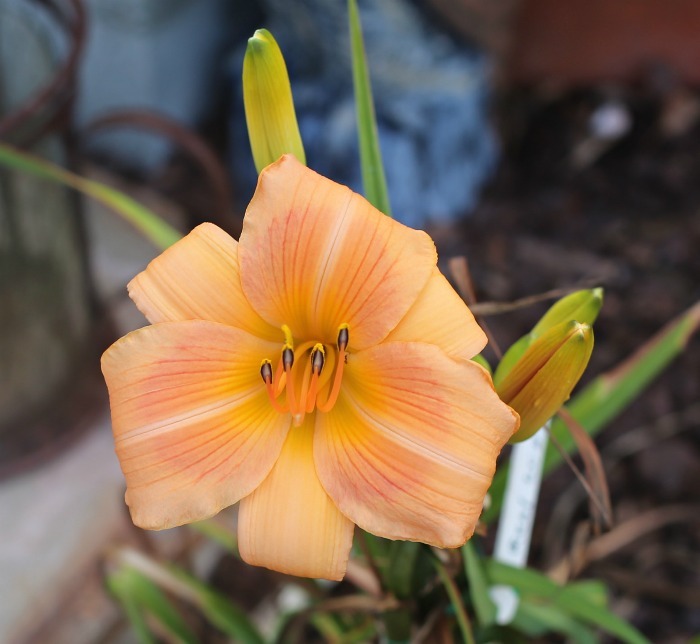 Some daylilies bloom only once during the year and others re-bloom a second time. The flowering season can be from early, middle to late. Some varieties will overlap two flowering seasons. 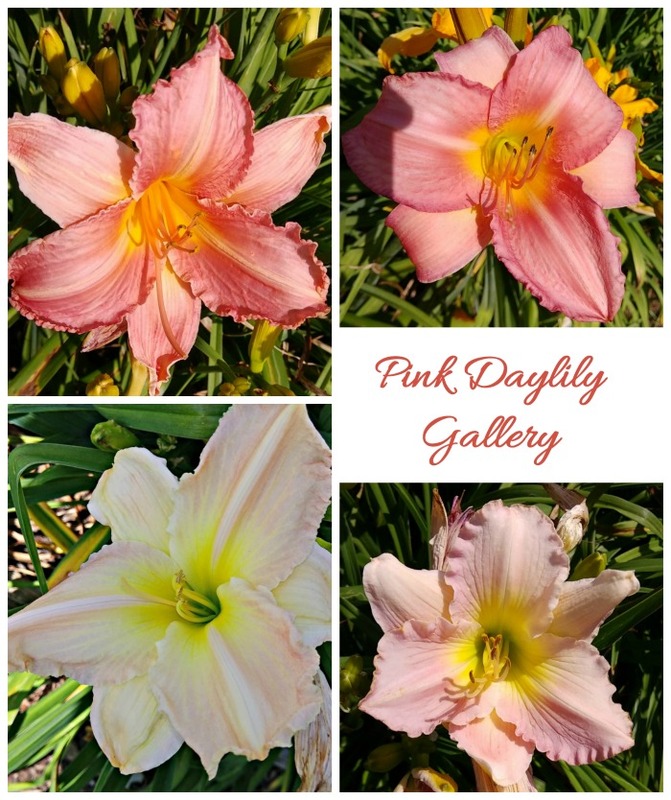 If you love daylilies, be sure to also check out my daylily gallery for many more named varieties. Once I made a decision on my choices, the owners Bob and Judy Bowman dug them up for me. Even though the daylilies were in the back of our car for the next five hours on our way back to Raleigh, they made it to their new home just fine. 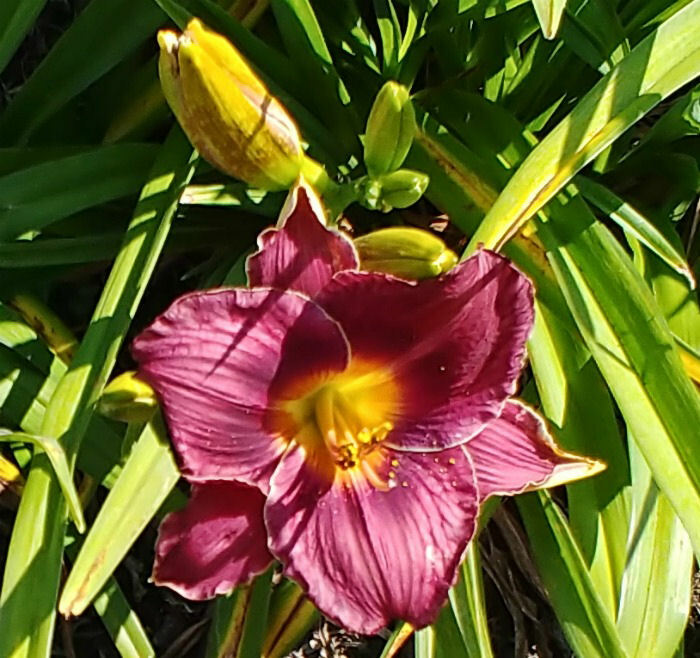 I chose three daylilies: Evening Solitude, Real Wind and Resphigi. I’ll share these with you as well as some other favorites that we admired while we were there. I’m sure a few of them will find their way into my garden sometime in future. 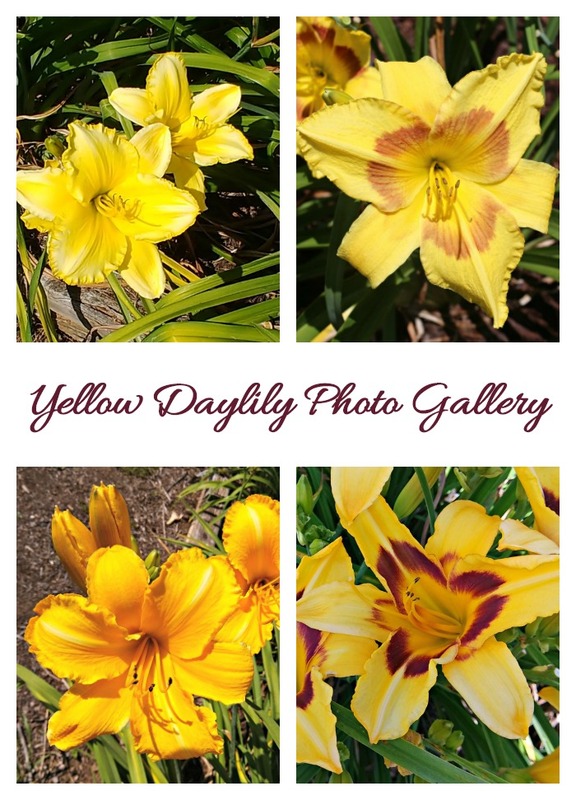 For our tour of the daylilies at Wildwood Farms, I have divided my photos into colors. 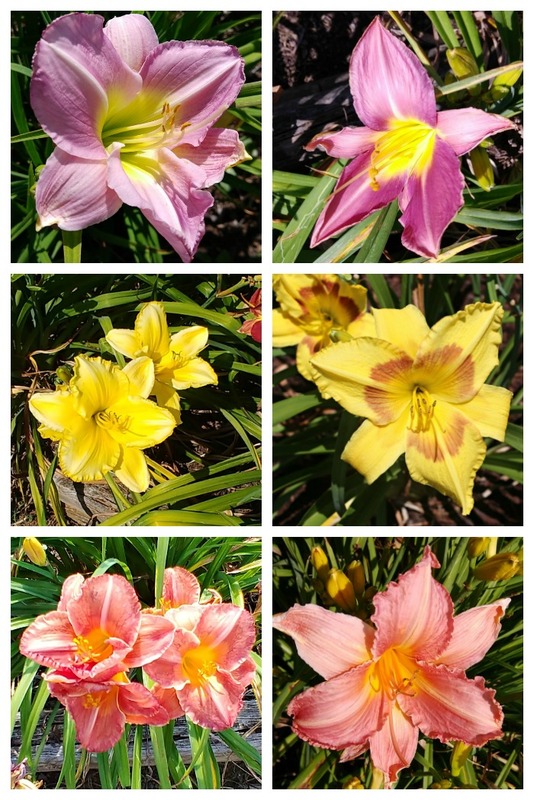 I’ve featured red, pink, yellow, purple and peach colored daylilies for you to enjoy. 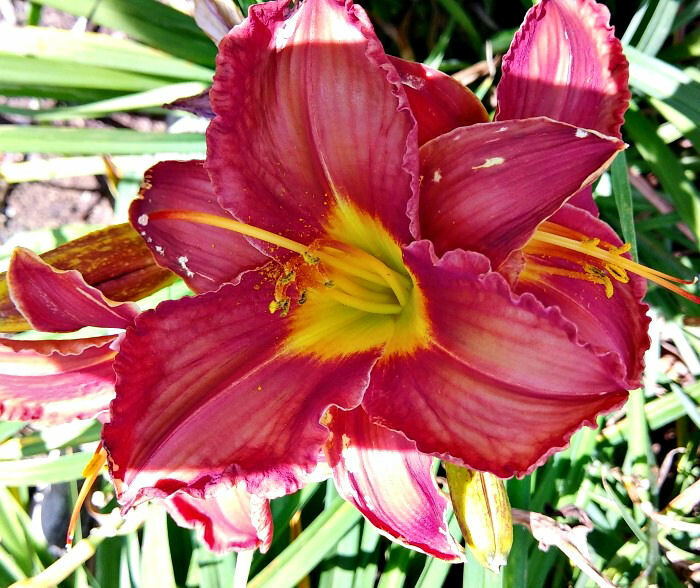 Red is such a passionate color and when it comes to daylilies it gives a real richness and regal look to the blooms. Here are some of my picks. A bright red self with a bright green throat color is a stand out for Kent’s Favorite Two daylily. This variety has 5 1/4 inch blooms on 25 inch scapes. Kent’s Favorite Two is an early bloomer with an extended bloom habit and also reblooms giving long season color. It is an evergreen tetraploid. The hybridizer for this pretty daylily is Kirchoff in 1988. The minimum cold hardiness for this daylily is 5a. This semi-evergreen variety with black red blooms has a velvety sheen to the petals. 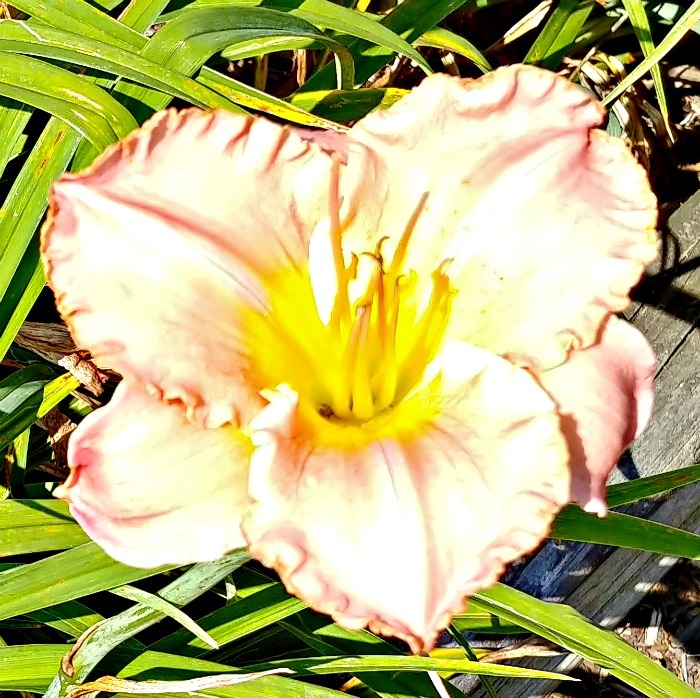 The bloom time is early to mid season and the daylily has an extended bloom. 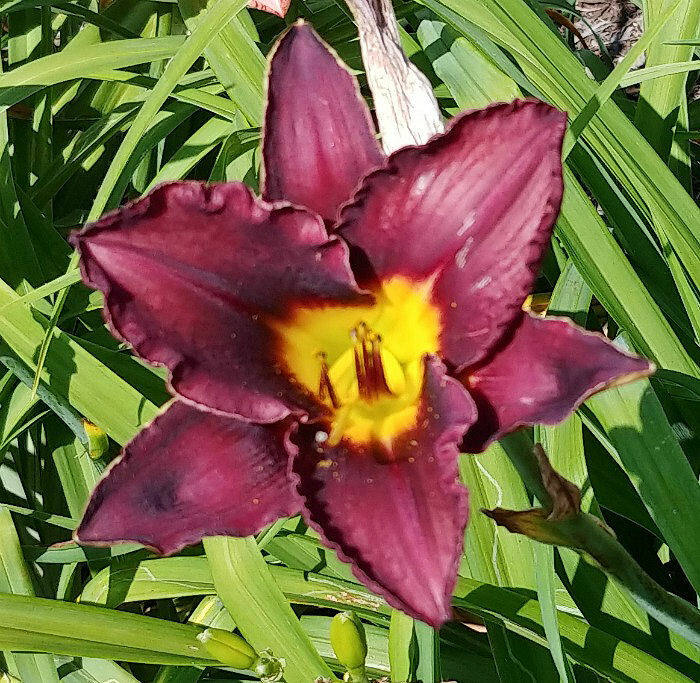 Black red with a yellow green eye and dormant foliage, Black Brian Bay daylily is a mid season bloomer that will re-bloom. The plant has 27″ scapes and 5 1/2 inch blooms. Hybridized in 1996 by Salter, the daylily is cold hardy to zone 4a. With a 26 to 30 bud count and 6 1/2 inch flowers on 24″ scapes, Whooperee will be a focal point in your garden. The plant is rose red with a green throat and has evergreen foliage. The plant is an early bloomer and will re-bloom for long lasting color. Hybridized by Gates in 1986, the plant is hardy to zone 4a. I love the bright and sunny look of yellow daylilies. One of the largest patches of yellow lilies grows in my test garden and just keeps getting bigger and bigger every year. Here are a few pretty options in bright sunny yellow. This pretty self colored golden yellow daylily is quite fragrant. It is hardy in zones 3a to 9b, which covers most of the USA. Norma Jeanne daylily can tolerate full sun to partial shade and grows to 36″ tall with a 6 inch bloom. Hybridized in 1988 by Stamille. Gold brushed bronze petals and a huge lemon colored throat graces Smuggler’s gold, reminding us of pirate’s treasure! 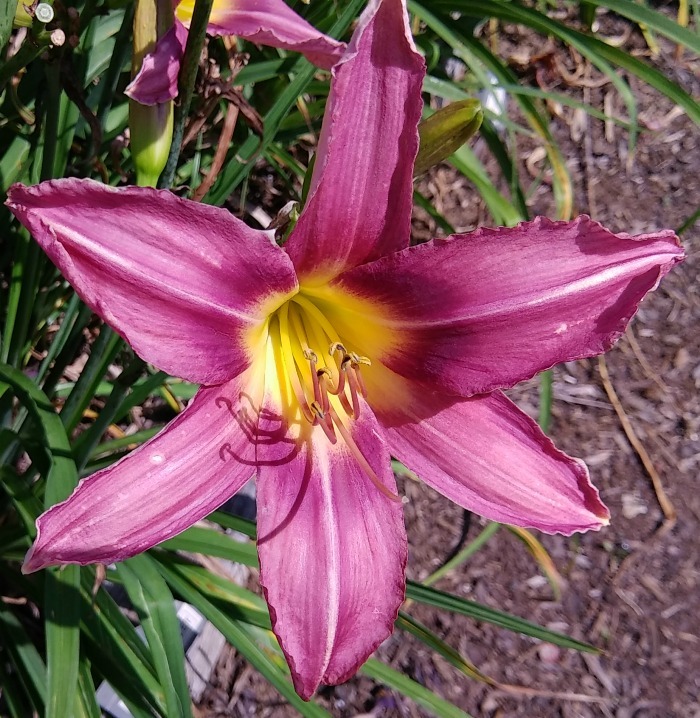 The daylily blooms in mid season with an extended bloom on 24 inch scapes and big 6 inch flowers. Smuggler’s gold has dormant foliage in winter and was hybridized in 1991 by Branch. 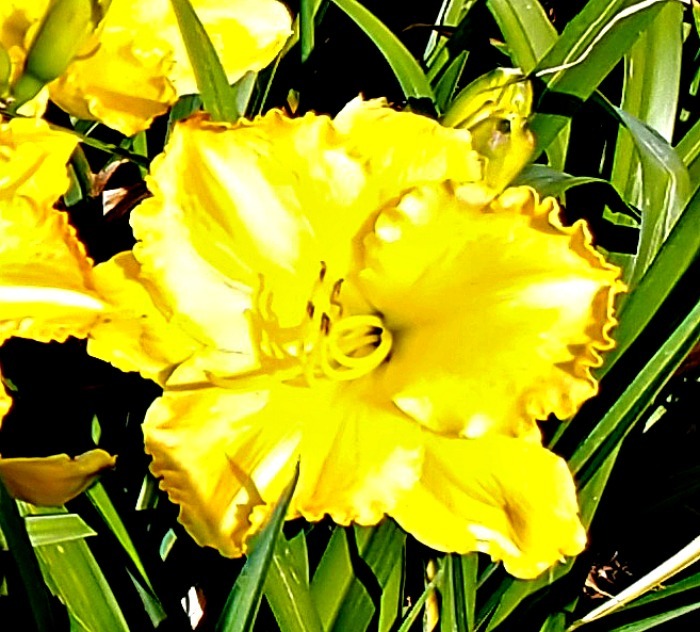 This majestic Daylily is bright yellow with a reddish wine eye. It is a mid season bloomer with an extended bloom. The foliage is evergreen. I have had King George growing in my garden for a few years. 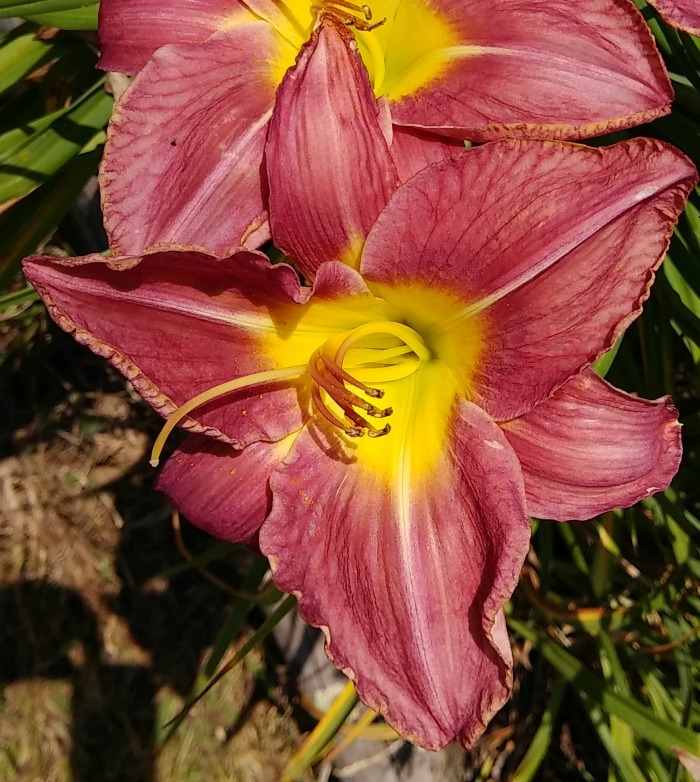 The daylily has naturalized beautifully and gives me a lot of blooms now. The scapes are 30 inches tall and the blooms are 7 inches. The daylily was hybridized in Rasmussen in 1991. This brilliantly self colored tetraploid is called Mary’s Gold. 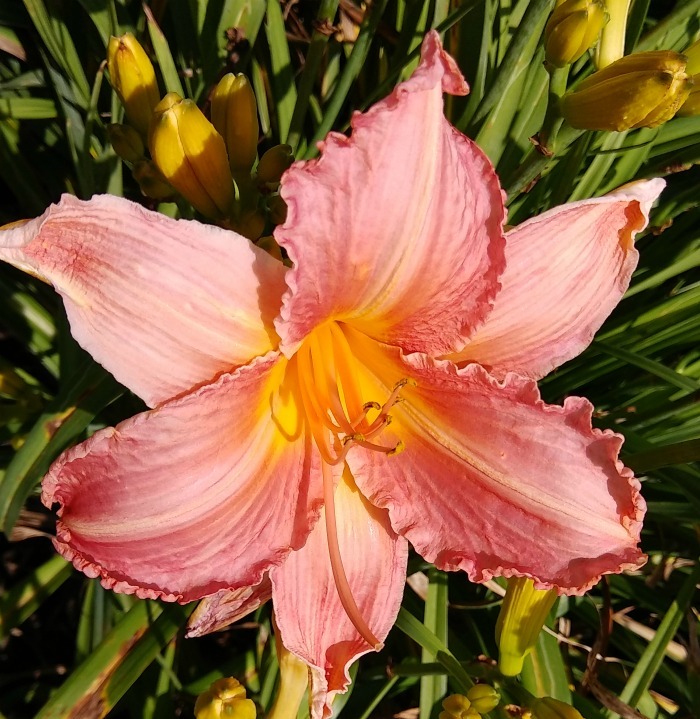 It is a mid season bloomer with 34″ scapes and 6 1/2″ blooms. The daylily is cold hardy to zone 3 and has dormant foliage. Hybridized by McDonnel-H in 1984. Love the contrast of the black and yellow! The name of this daylily brings to mind a beautiful table setting. Imagine this stunner in the center of the table? Hybridized in 1988 by Webster, this mid season bloomer is fragrant, as well. Centerpiece daylily is a bright yellow daylily with a purple eye. It has dormant foliage and grows to 26″ tall with 6 1/2 inch blooms. The daylily is hardy to zone 3. This early to mid season bloomer is called Oriental Dancer. 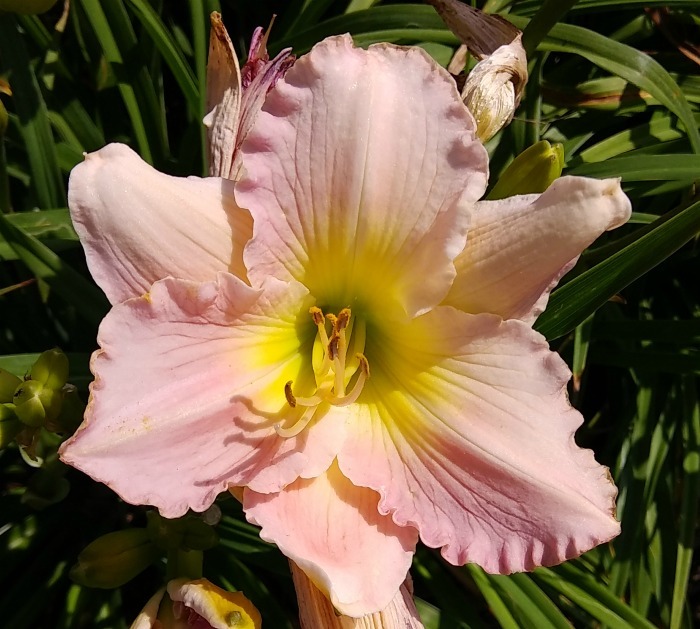 It has yellow, pink and cream petals with a lavender eye zone and yellow green throat. The scapes grow to 36″ tall with a 5 1/2 inch bloom. Oriental Dancer was hybridized by Brown in 1994 and has semi evergreen foliage. It is cold hard in zones 4a to 10b. Purple is such a regal color. It brings richness and depth to any daylily. Here are some lovely purple daylily varieties. Lavender deal was hybridized in 1981 by Kirby-Oakes. It is a fragrant mid to late season bloomer with extended bloom and it also re-blooms. The daylily has hardy to zone 3. This stunner is a purple violet blend with a dark purple eyezone and a chartreuse colored throat. It has a mid to late bloom season with 5 inch blooms on 20 inch scapes. The hybridizer for Etruscan Tomb daylily is Hanson in 1988. The daylily received an honorable mention in 1994 by the American Hemerocallis Society. This pretty daylily is called Evening Solitude. 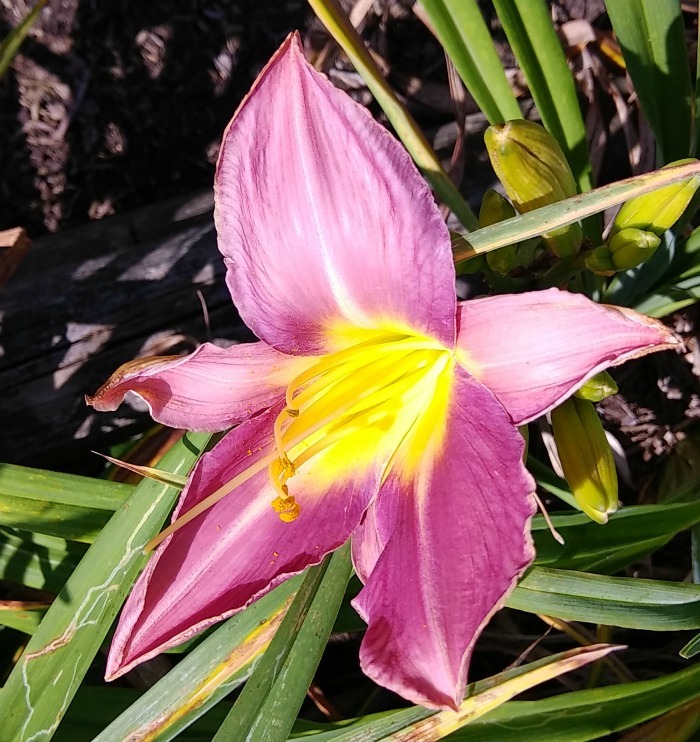 It is one of the daylilies that I purchased on my trip to Wildwood Farms. 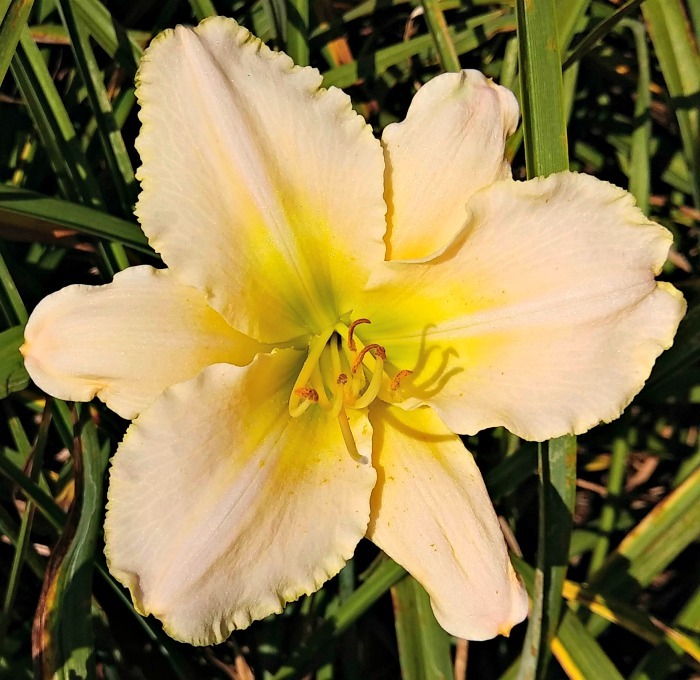 The daylily is pale lavender with a chartreuse colored throat. The scapes grow to 30 inches tall with a 6 inch bloom and evergreen foliage. The daylily was hybridized by Morss in 1991. It is cold hardy to zone 5a. If you are looking for a pretty purple colored daylily that will re-bloom, Mountain Violet daylily is for you. The color is a light purple with a violet band and yellow center. The scapes grow to 28 inches and the bloom size is 5″ tall. The daylily has evergreen foliage and is hardy to zones 5a. Hybridized by Munson in 1973. This stunner has a lavender color with a yellow-green throat and is fragrant. It grows to 22″ tall with 5 inch blooms and has an extended bloom time. Metaphor daylily starts blooming in mid-season and will rebloom. Hybridized by Gates. L in 1983, it is hardy to zone 5a. 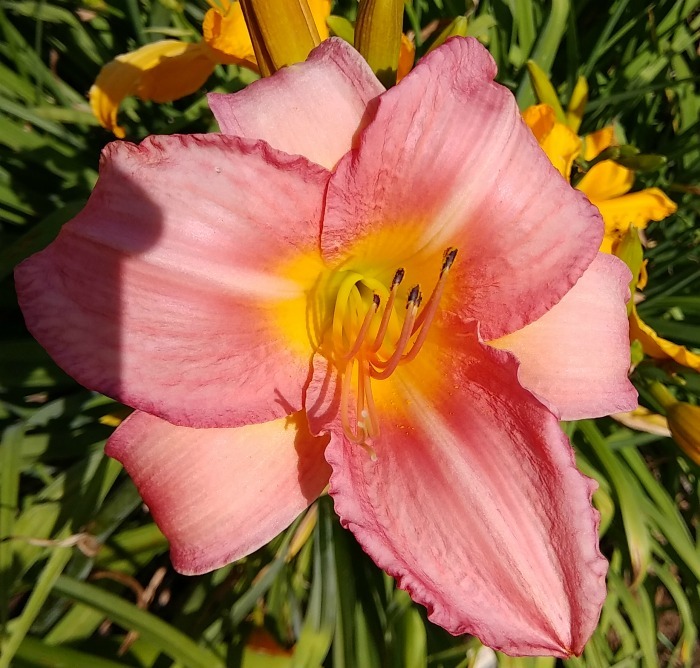 This pretty bicolor daylily is called Miss Jessie. It is a spider daylily with a purple and lemon coloring. 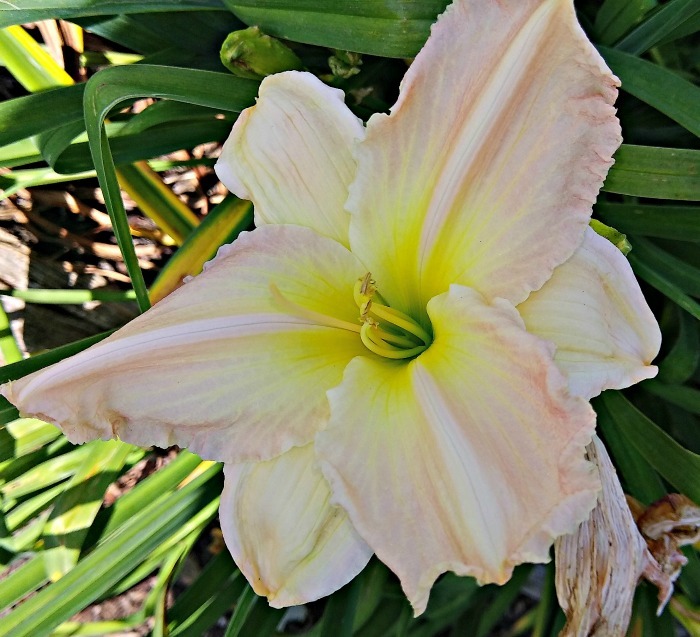 The daylily grows to 40″ tall with huge 7 inch blooms. It is a mid season bloomer with dormant foliage. Hybridized by Hardy in 1956, it is cold hardy to zone 3. 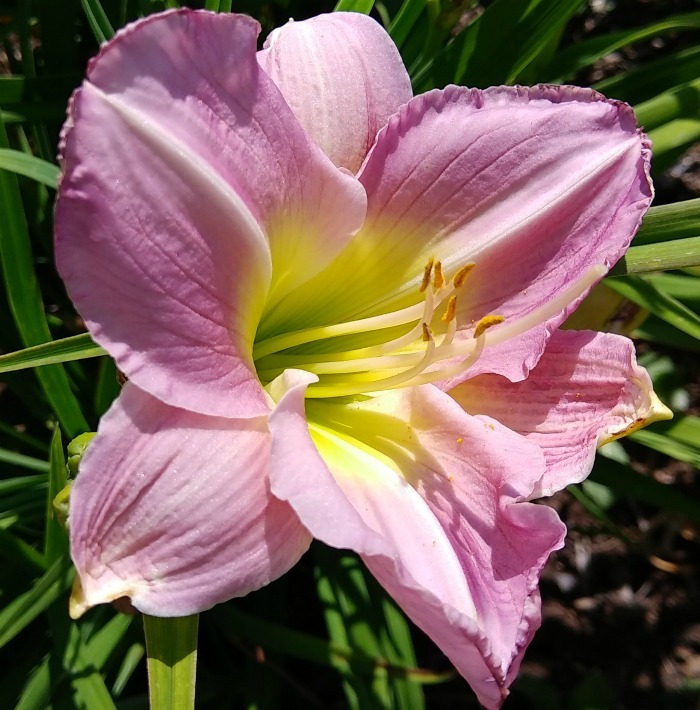 So romantic and feminine, the pink color of these daylilies makes them perfect for cottage gardens. Here are a few to choose from. The near white petals of Cameron Quantz daylily have a tinge of pink on them. The throat is yellow green. Huge 7 inch blooms sit on 28 inch scapes and the foliage is dormant in the winter. Cameron Quantz was hybridized in 1979 by Holman. It is an early to mid season rebloomer and is hardy to zone 3. Pale pink self colored with a yellow throat, this mid-season bloomer has semi evergreen foliage. It was hybridized in 1988 by Stamile. The scapes on Orchid Ice grow to 30 inches with a 6 inch bloom. The daylily is cold hardy to zone 4a. 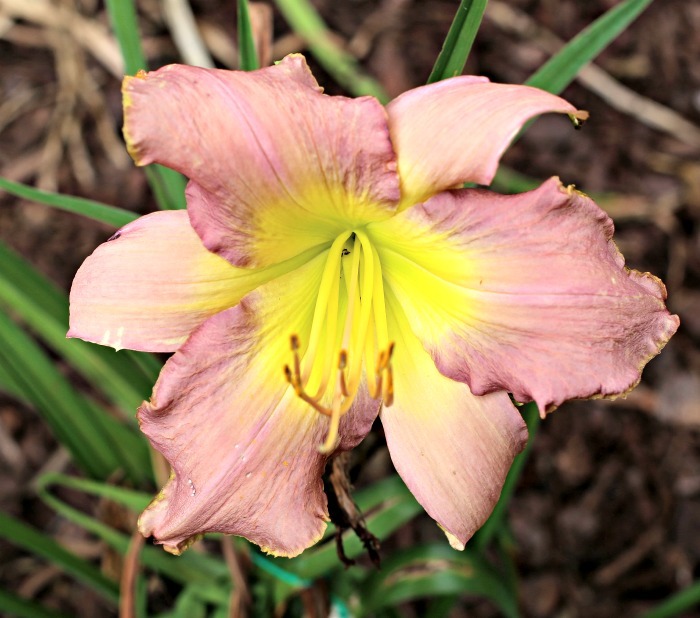 Rose pink petals and a greenish-yellow throat are the colors of My Girl Daylily. The scapes of this early to mid season bloomer are 23 inches tall and the blooms are 5 inch in size. My Girl was hybridized by Stamile in 1993. It has semi ever green foliage and is a re-bloomer. Hardy to zone 5a. This mid season bloomer is called Cedar Waxwing. It grows to 34″ tall with 6 inch blooms and has dormant foliage. The color is a pink blend with a yellow eye. The plant was hybridized in 1979 by Griesbach. 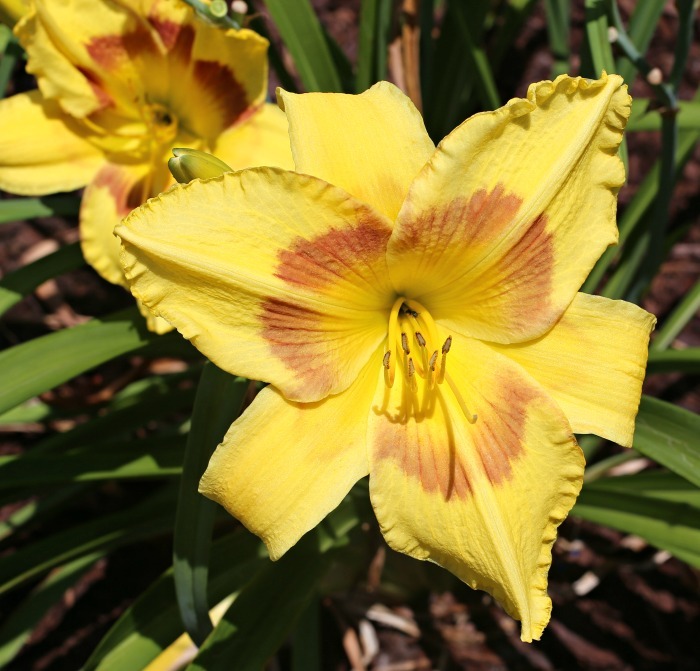 The daylily is hardy in zones 3a to 9b and likes full sun to partial shade. Perfectly at home in any cottage garden, this rose pink daylily has a gold throat. It has 26″ scapes and a 6 1/2″ bloom. The daylily is an early to mid season bloomer with an extended bloom time. The foliage is dormant in the winter. Decatur Captivation was hybridized by Davidson in 1986 and has no fragrance. 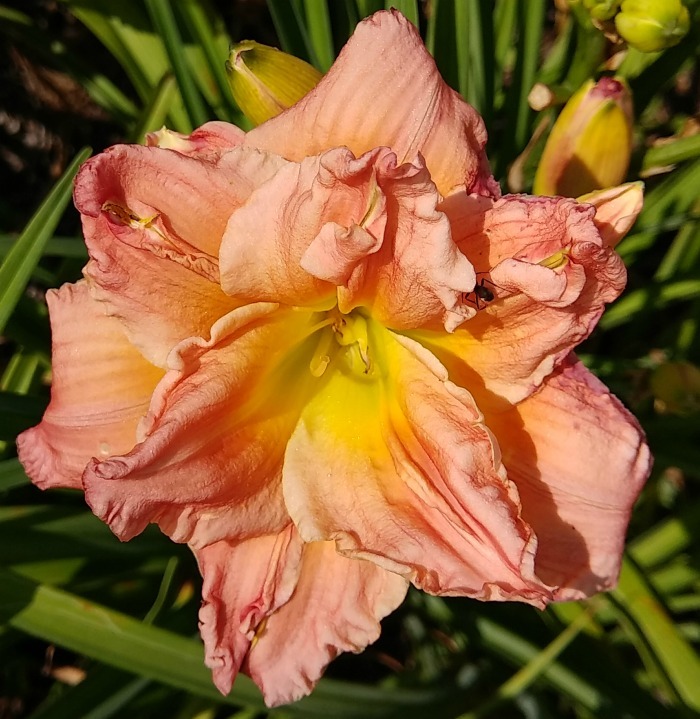 Peach is such a soothing color and is one of my favorites for daylilies. Here are a few of my favorites. This stunner is called La Fenice. It is salmon rose with a gold throat and ruffled petals. The daylily was hybridized by Munson in 1990 and the foliage is evergreen. La Fenice is a early to midseason bloomer with 28″ scapes and 6 inch blooms. It is also a rebloomer for long lasting color. Cold hardy to zone 5a. This variety has double petals and is peachy rose pink with a green throat. Sanford House was hybridized in 1985 by Kirchoff. The scapes grow to 26″ with a 4 3/4″ bloom. 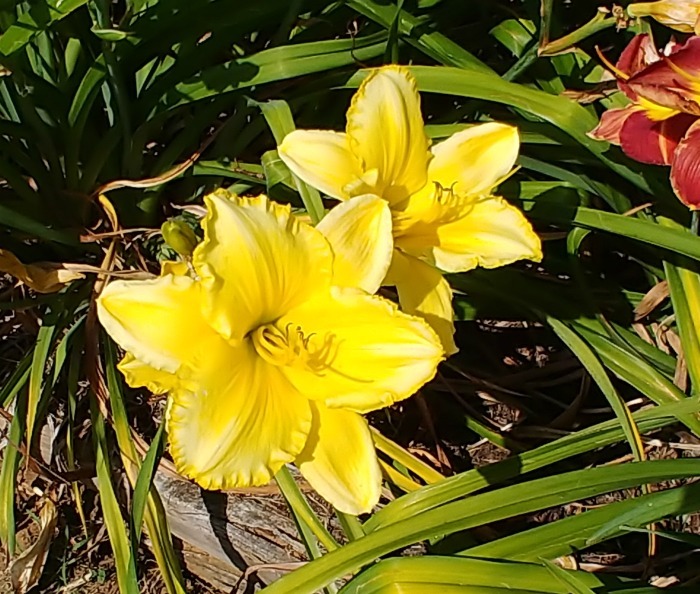 The daylily is an early bloomer and also re-blooms. Hardy to zone 4a. 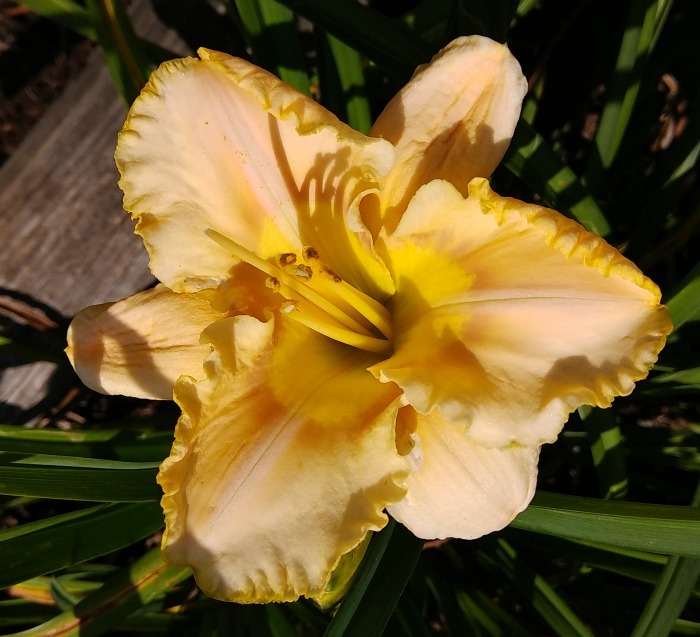 An early to mid season bloomer, Egyptian Pearl daylily has creamy peach petals with a green throat and yellow eye zone. 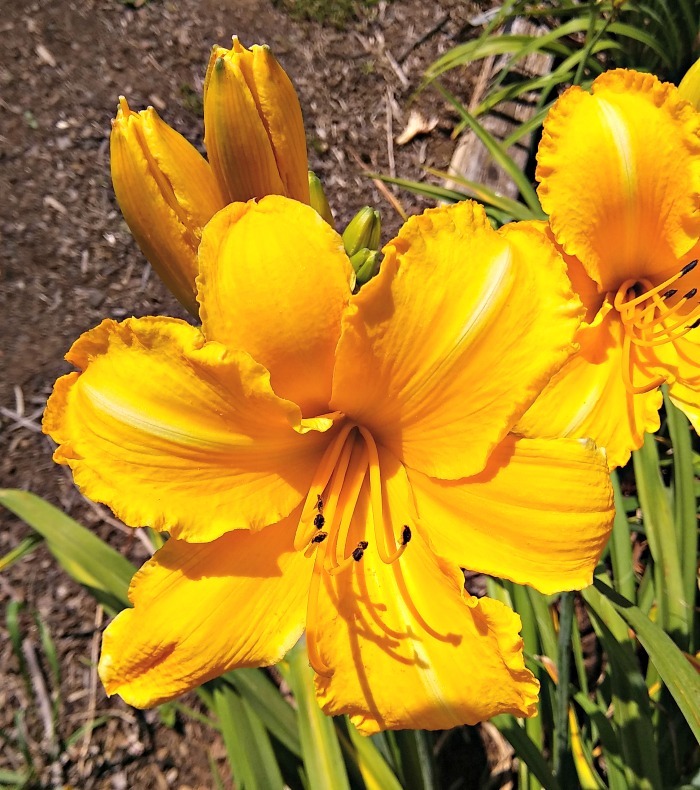 The daylily has 5 inch blooms that grow on 26″ scapes and every green foliage. Egyptian Pearl daylily was hybridized in 1992 by Morss. It is hardy to zone 5a. The final daylily in our tour of Wildwood Farms is Real Wind Daylily. I purchased this on our trip and it is right at home in the test garden now. This lovely variety has peachy orange petals with a rose colored eye. The scapes are 27 inches long and the blooms are 6 1/2 inches in size. Real Wind was hybridized by Wild in 1977. It is a mid to late season bloomer with dormant foliage in the winter. The daylily is hardy to zone 3. 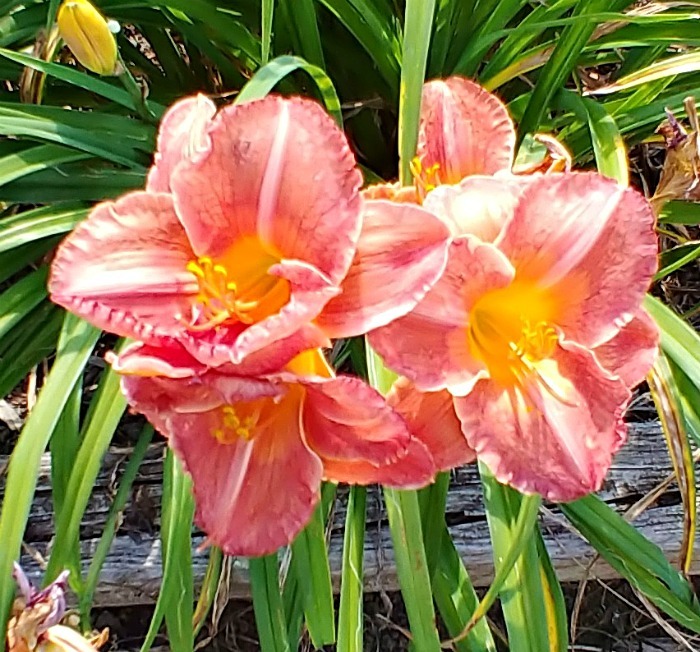 If you would like to be reminded of this post about the daylilies at Wildwood Farms later, just pin this image to one of your Flower boards on Pinterest, so that you can easily find it. 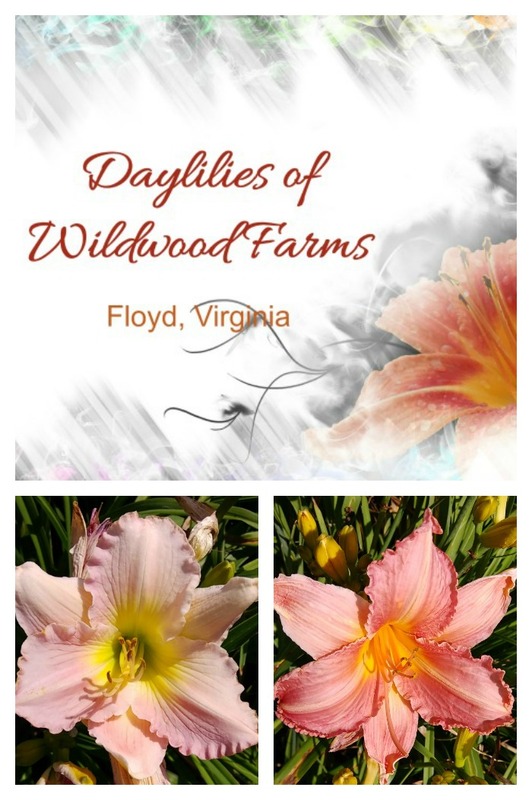 Wildwood Farms Daylily Gardens is located at 2380 Floyd Highway South, Floyd, Virginia, 24091. If you are visiting Virginia it is well worth taking a day trip to revel in their collection of daylilies. I hope you enjoyed my article on the Daylilies at Wildwood Farm. Now I want to hear from you. Which one is your favorite? I’d love to hear your thoughts in the comments below.